Through malvertising I came across an “Ngay” website which used an iframe to redirect to Rig EK. The payload was Smoke Loader which then dropped a XMR Miner. I’ve been using App.Any.Run sandbox a lot lately. Although I found the RigEK redirection using traditional methods and the payloads did work on my lab, I put the payload into Any.Run anyway as it portrays the IOC’s very well. The chain begins with malvertising which leads to a fake Kaleidoscope domain. The domain named “ngay23ne.cf” contains an iframe which leads to Rig EK. This campaign is known simply as “ngay” and was last seen as far as I know near the end of Jan 2018. Rig EK is it’s usual self and still using Flash exploit CVE-2018-4878. Otherwise it appears to be the same. The payload was Smoke Loader which immediately loaded an XMR miner. Below we can see the traffic. 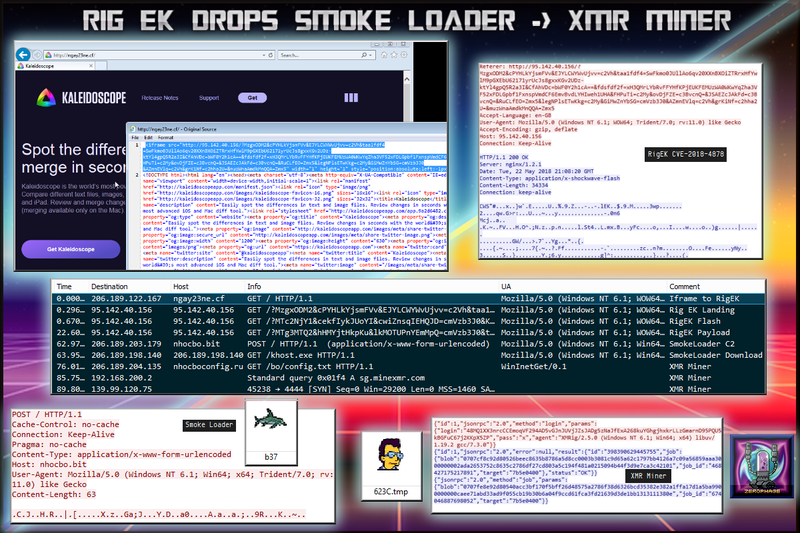 You can see Smoke Loader POST request which is followed by an EXE download. This payload then calls out then begins mining on port 4444.